The 6 Hours of Spa-Francorchamps (formerly the 1000 Kilometres of Spa-Francorchamps) is an endurance race for sports cars held at Circuit de Spa-Francorchamps in Belgium. The Spa 24 Hours had been introduced in 1924, and other races followed. As on the Nürburgring, both a 24-hour race for touring cars and GTs is held, and an endurance race for sports cars and GTs. The sports car race began in 1953, and in 1963 joined the World Sportscar Championship and was extended to 500 km. Starting in 1966, it was run for 1000 km, following the 1000 km Nürburgring and 1000 km Monza. 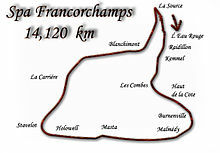 Due to safety problems on the traditional long and very fast 14 km track over public roads, the race was discontinued after 1975. The 1000 km race was resumed in 1982 after the track was made safer by shortening it to 7 km. In 1989 and 1990, the race distance was lowered to 480 km as a rule change required the use of Formula One-derived engines that lasted longer. Due to the decline of the WSC, the "1000km" was discontinued after 1990 even before the WSC closed. The race was revived in 1999, as a part of the SportsRacing World Cup (the predecessor to the FIA Sportscar Championship), running to a 2-hour, 30 minute time limit. In 2003, the 1000 km race was resumed as a joint event of the FIA SCC with the British GT Championship. In 2004, it was part of the Le Mans Series (LMS), and in 2011 was also part of the Intercontinental Le Mans Cup. From 2012 onwards the race has been part of the FIA World Endurance Championship, albeit in the format of a six-hour race. Jacky Ickx currently holds record of most wins, having won the race 5 times, in 1967, 1968, 1974, 1982, and 1983. He is also one of two drivers to win the 1000 km on both the original and current circuits, the other being Derek Bell. ^1 The 1975 event was originally scheduled for 1000 km, but was shortened to 750 km the day of the race due to an approaching storm. ^2 The 1985 event was originally scheduled for 1000 km, but was shortened to five hours (848 km) after the ensuing 40-minute caution caused by the collision of the Bellof/Boutsen Brun Motorsport Porsche 956 with the Ickx/Jochen Mass Rothmans Porsche 962 at Eau Rouge. Bellof died in the hospital afterwards, and officials ended the race at the five-hour mark, after 122 of 145 laps. ^3 The 2002 event was stopped early due to heavy rain. ^4 The 2010 event was red flagged during the race due to electrical outages. The race covered approximately 975 km when it on a six hour time limit. Wikimedia Commons has media related to 1000km Spa. This page was last edited on 20 March 2019, at 09:41 (UTC).